Protesters marched from one of Riverside City College’s free speech areas – the steps of the Martin Luther King Jr. building – to the Riverside Community College District’s Centennial Plaza on Market Street. This congregation was sparked by a series of recent protests against the hiring of District Compliance Officer Lorraine Jones. Centennial Plaza’s doors were temporarily-locked, but the activists were later allowed access to the District’s bi-monthly Board meeting. Some of the members from the march, have attended District board and committee meetings since April 5. The protesters’ concerns arose due to a lack of inclusion regarding Jones’ recent hire as District compliance officer. At those protests students voiced their concerns and said it could potentially affect other students within the District. Board members cannot respond to public comments that are not agendized, due to the Ralph M. Brown Act 1953 (not to be confused with CA Government Code 54950). 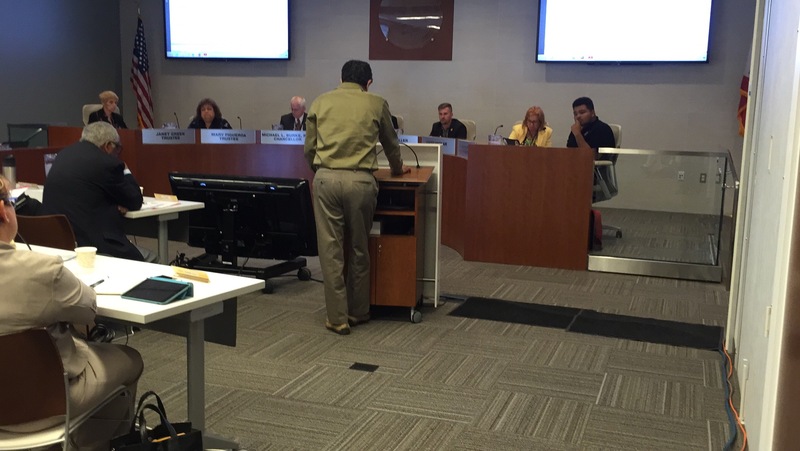 Another RCC student expressed her concerns about the District’s recent hire and elaborated on the roles women play in society – during an agenda section labeled “Comments from the Public,” on April 19. Amro also shared her concerns about the hire and how this action may affect the District’s reputation. Jones declined to be interviewed in person and did not respond to voicemails left by Viewpoints. RCCD Board of Trustees Vice President, Nathan A. Miller was ill and not present at the April 19 Board meeting, but offered his views in regards to the April 5 protests, in an interview with Viewpoints. RCCD Board of Trustees President Virginia Blumenthal shared her views on April 26, in an interview with Viewpoints, in regards to the position of District Compliance Officer, and how that position has evolved overtime. “That has now become a position that can affect other people than what it used to be,” she said. “We should take a look on who should be at the interviewing table. Now that does not mean that the people at the interviewing table have power of veto, or what is said dictates who is hired. That is up to the chancellor and then up to the Board, but I think the more input we have, the better it is,” she said. Dariush Haghighat, gave an apology on behalf of the Faculty Association at the May 3 board meeting to the students and members involved in the protest, for not coming to their aid when the board initially denied extending time for Mosavi to complete her statement on April 5. “Please accept our sincerest apologies, and Faculty Association’s deepest appreciation for the example your bravery set for us all … We are all greatly more indebted to your courage and bravery,” he said. Haghighat’s comments moved Mosavi to tears and she later expressed her gratitude toward him. “I was so incredibly moved to tears with his speech,” Mosavi said. “I was just so honored to have that privilege to have him say those amazing things about me. To feel that way about me is incredibly humbling to hear that from any professor. After his speech Haghighat turned to the protesters and urged them to put down their signs and walk out with their heads held high. All the activists accepted, and peacefully exited the building in unison. RCCD Chancellor Michael Burke gave a statement regarding campus safety at the District’s regular board meeting May 3. “As the Board is aware I have recently commissioned a task force on college safety District-wide … After listening to the concerns of students around campus safety and consulting with Dr Haghighat, I will be enlarging the scope of that task force to insure that it includes campus safety, specifically to … women on college campuses,” Burke said. The task force will be led by RCC President Wolde-Ab Isaac; his appointment is scheduled, for the District’s next committee meeting on June 14.